Including last year’s postseason, the Cavaliers have now reeled off 10 straight wins over the Celtics at The Q. In those victories, the Cavaliers have defeated Boston by an average of 11.0 points per contest. Lebron as usual stuffed the state sheet with 38 points, seven rebounds, six assists, four steals and three blocks. Anderson Varejao had a solid game. He flirted with his seventh double-double of the season on Friday – tallying 14 points and nine boards. In the last seven games, the Wild Thing is averaging 13.0 points on .586 shooting, averaging 9.4 rebounds per contest. 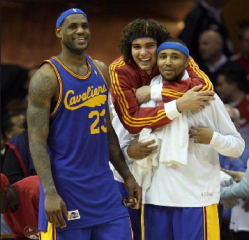 In seven starts this season, Varejao is averaging 15.0 points on .569 shooting, grabbing 9.4 rebounds per game. Boston resorted to a Hack-a-Ben strategy past the midpoint of the fourth quarter. Boston fouled Wallace on five consecutive Cavs possessions, but end up making 5-of-10 at the foul line.